Understanding how people learn differently and must be taught differently! We all have our natural and preferred learning style. Individual learning styles are made up of a combination of learning through seeing, doing, telling and listening. Our dominant learning style normally determines our communication styles and can show us how best to teach and to learn. For example auditory learners normally teach through stories and lectures. This brief article discusses the basic learning styles, how different learners learn best and how to adapt our teaching methods for great results. When we teach a group of learners with all of the differing learning styles, it is critical that we involve them through all of the different techniques. Who should know and understand learning and communication styles? Parents, teachers, lecturers, speakers, trainers, facilitators, presenters, leaders, managers and anyone who uses communication on a daily basis. Yes, all of us! Remember. There is no such thing as a stupid learner, there is only an communicator or educator who has not YET found the key to sharing information with that person. Visual learners typically remember and grasp concepts through visualisation. They normally have a good sense of direction because they picture and memorise landmarks, maps and directions. · Many prefer to see and read information in writing. They often find lectures to be boring. They like to doodle, draw and look out of the window. · They remember details including colours, faces, landmarks and spatial arrangements. They learn best by seeing what they are being taught. 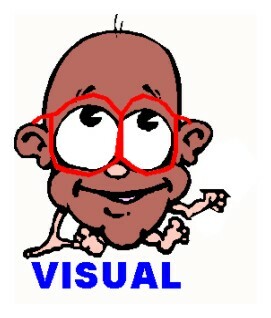 Visual learners typically prefer images, maps, graphs, and other visual representations over other forms of instruction. They will find that if they include images, mind maps, lists, and other visual techniques in their notes then they will have a better chance of remembering key information. Include photographs, models, diagrams, mind maps, word webs, visuals to help visual learners to swiftly retain knowledge and understanding. Visual students should colour highlight key items, create mind maps and use flashcards when learning. Stay away from lecturing without visuals. Too many words will switch them off. Auditory learners are sound-based, thus they learn best by listening and talking aloud. They typically notice and remember words and sounds. They remember what they hear. They are normally good with language. They often read to themselves as they study. They remember the details of conversations, arguments and lessons. They are can be very distracted by outside noise and sounds. Auditory learners learn best through hearing the lessons. They often need to read the written word aloud to remember key points. Simply repeating over and over in their heads – is a key learning method. Audio mind maps – mind maps with words are great tools for Auditory learners. They love to learn through stories and memorable quotations. Verbal repetition is an effective means of study for auditory learners. Teach verbally and supply written instructions for assignments. Ask them to highlight key learning points, by underlining – or with a marker. Involve them through group discussion. Use videos to complement the written text. Allow time to question, discuss, read out loud and talk through problems. Record lessons on audio/ video and give them copies to listen to or watch in their own time. Use stories, quotations, proverbs and audio mind maps as a method to convey lessons and messages. 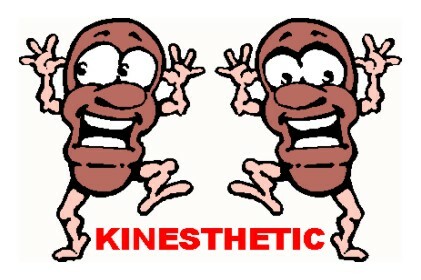 Kinesthetic learners typically learn best by experiencing and doing. They are naturally good at physical activities like sports and dance. They are good with their hands and enjoy nads-on learning. They typically like how-to guides and action-adventure stories. They might pace while on the phone or take breaks from studying to get up and move around. Some kinesthetic learners are fidgety and have a hard time sitting still. They are often sensitive and need to feel safe and protected. Stay away from stern reprimands, anger, violence and shouting as this disturbs them tremendously. Kinesthetic learners learn best through experience, such as making things, physically colouring in, manipulating items, simulations and role plays. It is critical to physically involve them in the learning process. They enjoy and learn well from experimenting and 1st hand experience. Movement and participation are critical to their learning. They learn best when activities are varied during the programme/ semester and during each class period. Vary instruction methods through lessons to retain their involvement. Build hands-on lessons into the curriculum. Use role-plays to build strong further understanding of key concepts. Give them opportunities to team up with small discussion and experimenting groups as they learn concepts and lessons. Plan field trip to reinforce multiple key concepts. Allow students to stretch partially and move to avoid them losing concentration. Never put them in embarrassing situations, or personally attack them. This entry was posted in communication, diversity, how to learn, how to teach, kinesthetic learners, learning, teaching, VAK, Visual Learners and tagged family, How to assess the communication styles of your family, How to assess the learning styles of your family, How to assess the learning styles of your students, How to assess the learning styles your child’s teacher., your child, your child’s teacher, your clients and your friends. by BrianVMoore. Bookmark the permalink.